TORONTO/VANCOUVER (Feb. 18, 2016) – The National Hockey League Players’ Association (NHLPA) is pleased to make a donation of 25 complete sets of new hockey equipment to KidSport BC through the players’ NHLPA Goals & Dreams (G&D) fund. This G&D donation was announced yesterday afternoon by Devin Smith (G&D Chairman) and Pete Quevillon (KidSport BC Director) at the Kerrisdale Arena in Vancouver, B.C. 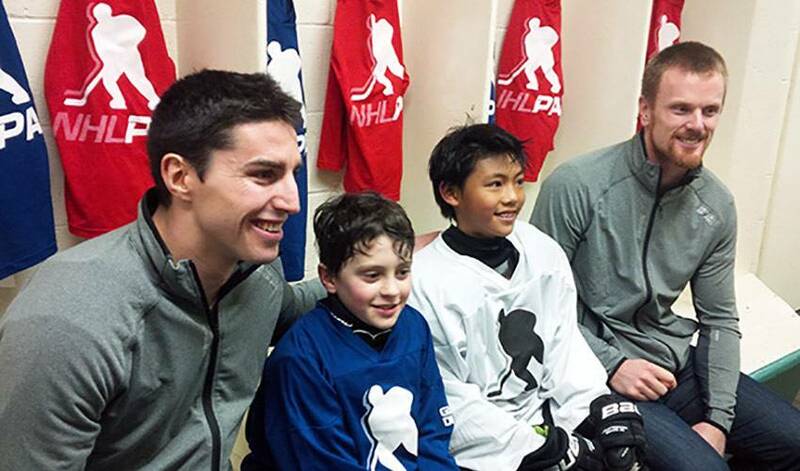 Prior to the formal announcement of the G&D donation, NHLPA members and Vancouver Canucks players Daniel Sedin and Alex Burrows surprised 30 youth hockey players – who are associated with KidSport BC – in their dressing room after practice. Over the past 10 years, G&D has made an annual equipment donation to KidSport BC, which gets distributed to its community chapters across the province. Over 500 children in KidSport BC have received equipment through G&D donations since 2006. Many players have participated in these G&D events with KidSport BC, such as Kevin Bieksa, Alex Burrows, Dan Hamhuis, Jyrki Lumme, Kirk McLean, Markus Naslund, Mason Raymond, Daniel Sedin and Henrik Sedin. The equipment donation made yesterday by G&D is valued at approximately $12,500 and it will help KidSport BC give more youth the opportunity to play hockey. Going up against the best hockey players on the planet doesn’t bring out the nerves in Jacob de la Rose. Watching the horse he co-owns with another NHLer compete? That’s an entirely different story. G&D Donates 25 Sets of Hockey Equipment to Project “Come Together – Tous Ensemble"
The donation was unveiled on the Canada 150 Rink at Parliament Hill with PPS, RCMP and local children from the Conseil des Écoles Catholiques du Centre-Est (CECCE) elementary school board. If you're an Ottawa Senators fan, you may want to pay special attention to this week's Player Q&A and get to know Alex Burrows.